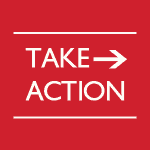 Help Hold the Pittsburgh Mayor and his City Council Personally Liable! 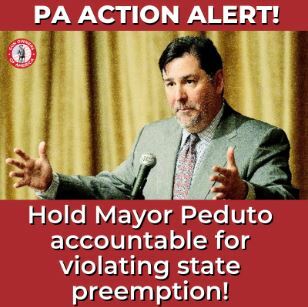 Click on the Take Action button to email state Attorney General Josh Shapiro, urging him to prosecute the criminal actions of Mayor Bill Peduto and the Pittsburgh City Council. And for those in Allegheny County, call DA Stephen Zappala with the same request at (412) 350-4400. Or copy-and-paste the message at the bottom of this email and send it to his media director, Mike Manko, after clicking here to pull up his email address. Allegheny County District Attorney, Stephen A. Zappala, notified the City that their proposed actions were illegal and that they could face criminal charges, but the Mayor and City Council ignored his warnings and introduced proposals to violate the preemption law and your Constitutional rights. You can also call Attorney Shapiro at: (717) 787-3391. Finally, the Allegheny County Sportsmen’s League and the Firearms Owners Against Crime are currently taking legal actions against the Mayor and City of Pittsburgh. 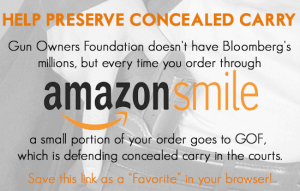 You can read more about this effort here and contribute to this worthy cause. As an Allegheny County resident, I want to thank you for your January 9, 2019 letter to Mayor Peduto and the Pittsburgh City Council advising that “City Council does not have the authority to pass [gun control] legislation.” Nevertheless, the Mayor and City Council have acted in defiance of the preemption law and introduced proposals 2018-1218, 2018-1219, and 2018-1220. Quite frankly, I am outraged! I stand with the brave citizens who have come forward to file private criminal complaints and demand that you uphold the Constitution and laws of this Commonwealth. Municipalities have no authority to enact gun control legislation and the City of Pittsburgh’s actions are brazen lawlessness. I agree wholeheartedly with those filing criminal complaints that Mayor Peduto and the Pittsburgh City Council have violated Article 1, Section 21 of the Pennsylvania Constitution and 18 Pa.C.S. §§ 901, 902, 903, 913, 5301, and 6120. Mayor Peduto and the City Council members have attempted, solicited, and conspired to introduce and have introduced proposals 2018-1218, 2018-1219, and 2018-1220, which are preempted by Article 1, Section 21 and 18 Pa.C.S. § 6120, for the sole purpose of denying or otherwise impeding individuals residing in or traveling through Pittsburgh the exercise or enjoyment of their rights and privileges. All too often, I see politicians and government officials defy the law with impunity while ordinary citizens are expected to toe the line. This must stop! I urge you to stand up for justice and end the double-standard. Please prosecute the Mayor and City Council for their criminal behavior. Gun Owners of America will keep me informed as to your decision.